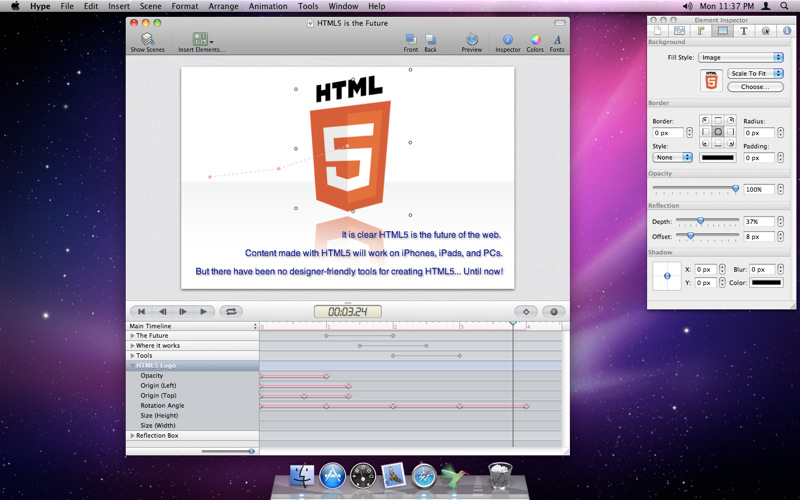 Hype is an HTML5 Animation Builder for Mac OS X. 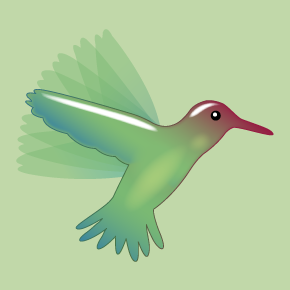 It allows you to build interactive sites in HTML5 that rivals Flash. 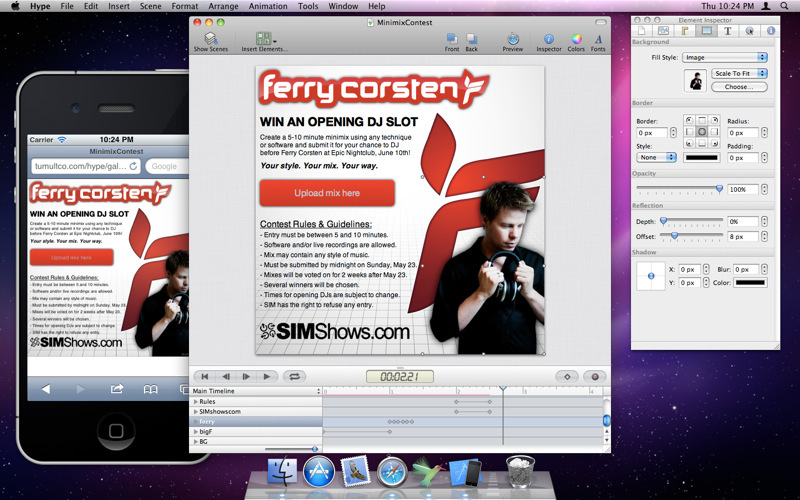 Hype launched last Friday and they are already the top grossing app on the mac app store. Earlier today I had a chance to catchup with one of the cofounders, Jonathan Deutsch, to talk about his experience leaving a safe job at Apple to launch a startup, where his inspiration came from for Hype, and his experience with Y Combinator. Where did the idea for Hype come from? At one point after a trip to Europe, I wanted to make a photo website that would be as nice as a beautifully bound photo album, and use lots of effects. Coding this with HTML5 would have been a nightmare. There had to be a better way, and that’s how the idea for Hype was born. It stuck with me, and eventually I realized this was going to be a great opportunity for a business. Where did you work prior to launching your own startup? I worked at Apple. I was the engineering manager for the Mail.app back end (Mac OS X), but also worked on software updates, automation technology, SJ keynote demos, and other engineering projects. What made you decide to leave a “safe job” at Apple and build a risky startup? I was faced with the decision of continuing to work with the great people on my team on a clearly high impact project, living with the “what if” syndrome, or trying to forge my own path. “Regret Minimization” is what should win out in life, so it did. I had done a lot of different projects at Apple, and felt I made my mark both internally on the company and externally on Mac OS X.
I had established a fair number of relationships at Apple, and felt if my startup failed I could always go back. At Apple the question is often “how many times have you worked here?” When you’re hired, you get new hardware… so I like to joke that the worst case is I’d end up with a new Mac Pro out of the deal. Walking away is bittersweet, and there’s definitely a social and professional net that you leave behind. That’s one of the main reasons we decided to pursue Y Combinator. We didn’t want to be on an island by ourselves. Apple is publicly against Flash. Did this have any influence on your decision to build Hype? Not specifically. While Flash enables some really great content on the web, there’s lots of people who aren’t favorable on it due to its lack of accessibility, CPU usage, or crashes. It isn’t appropriate for mobile. To Adobe’s credit, they’ve been more active lately in trying to address these issues. How did you get into to Y Combinator? We got in through Y Combinator through the normal interview process. Ryan and I both found the questions from the initial application were great for helping to clarify our business plan, realizing our target markets, and helped ensure the two of us were on the same page. I’ve recommended to everyone I know that even if you’re not going to apply to YC, fill out the application. What has been your experience with Y Combinator? YC is definitely worthwhile. The network effects are staggering… it gives any YC company an advantage in making the right contacts, finding investment, and being in a support net with others in the same boat. And if you’re starting a company, why wouldn’t you want every advantage available to you? Paul Graham, Paul Buchheit, and Harj Taggar all give great advice with brilliant ideas sprinkled in. The dinners are fun, and there’s a lot that we learned from the speakers. Most founders would come early before each dinner just to hang out and discuss their startups or demo their products. The atmosphere is electric and contagious. Y Combinator is also heavily focused around finding additional investment. Startups always need more cash! Finding funding was not a major concern to our us, as our “old school” business plan was to sell Hype from the get-go, and we had confidence it would be able to generate revenue. In that regard, we didn’t take as much advantage of YC as other companies are able to. We did make several strategic connections through investors to other companies and individuals in our space that have already been of benefit. As an aside, during the YC timeframe we were so focused on developing our product that Paul Graham actually emailed us and was concerned that we hadn’t gone to enough office hours! Don’t forget to checkout Hype! Previous Previous post: Weekly reader question: How has your startup “failed faster”?